Whether it is for a weekend getaway or for a summer long tour around the world, there are a number of smartphone apps that will help to keep a person organised and enjoying the time away from home. The market is flooded with so many travel app options, it is hard to choose the best ones. There are, however five apps that every traveller should download as recommended by Bonvoyage.co.uk. Before even heading out of the house, it is important that any trip start correctly. Unfortunately, most people find themselves rushing around the house when it is time to pack. Inevitably, something will get left behind or forgotten. Packing Pro takes the guesswork out of packing and helps a person to organise and pack all of the right things in the suitcase. There are easy to use lists and the app will even give suggestions based on factors such as number of people, climate and duration of the trip. Packing Pro helps a person to start the trip with all of the right items. When travelling abroad, being able to communicate is crucial. Unfortunately, a person may not be able to speak the native language, so a translation tool is certainly in order. Thumbing through a dictionary or translation book will work, but is cumbersome and slow. There are pocket translators, but this is just one more thing to pack and hold onto. Since a person already has a smartphone, a translation app is easy and perfect. Google Translate is a free program that is simple and easy to use. One simply speaks into the app and the saying is translated. A person can also have the text displayed on the screen. This is a simple app that may prove to be a life saver. Keeping track of hotel reservations and flight numbers can be a daunting task at times. TripDeck is a free app that keeps all of this information in one tidy place. The app organises all of the data and gives the user a simple and clean interface. This is perfect for any traveller that needs help with organisation. When travelling to a new city or country, it is best to know all about the local customs and attractions that are not to be missed. Carrying many guidebooks in one’s purse or backpack is not always convenient. 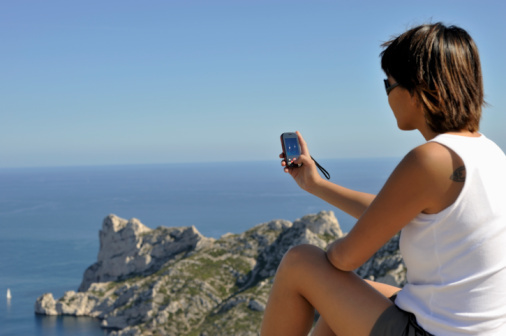 Luckily, Lonely Planet has a number of guides that are available as smartphone apps. These apps have the same information as one of the books, so one can be sure to have a great resource in their phone. Finally, one needs to have a converter app on their smartphone. Hi Converter is able to convert currency, clothing size, and more. This app boasts more conversions that any other on the market, so there is no need to have multiple apps for this purpose. There are many more apps that are useful for the weekend or frequent traveller. These five are essential ones that should be on every phone. Then, it is just a matter of finding other ones that may come in handy for that next exciting excursion.